I know we’re not yet clear of the holidays, but you might want to make room on your calendar for the early 2013 lineup of kid friendly concerts at SeaWorld Orlando. 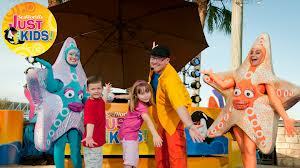 Bring your little ones to sing, dance and play the day away at SeaWorld’s Just For Kids festival. Experience live shows, enjoy the park’s kid-sized rides, and meet adorable animals. It’s a festival that’s Just For Kids, and only at SeaWorld. Enjoy Just for Kids on Saturdays, January 12 – February 2. I’m glad to see a lineup that focuses on the music instead of some of the third grade imitations of the TV shows the festival previously had (I’m looking at you Lazy Town). Concerts are included with park admission, with show times at 11 a.m., 2 p.m. and 4 p.m. at SeaWorld’s Nautilus Theater.